On approach to Carbonate Peak. 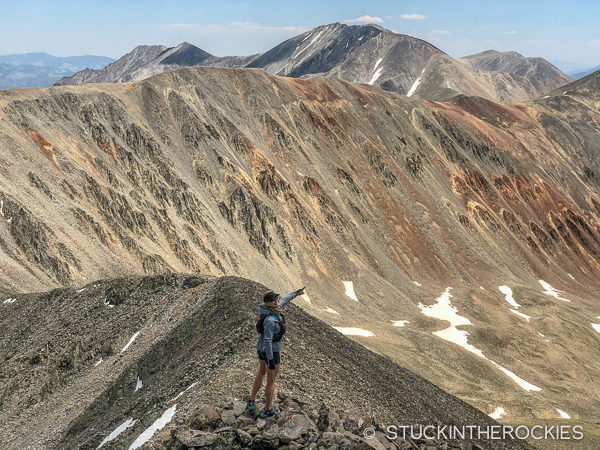 For a long loop up high in the Southern Sawatch Range, it’s worth visiting the region around Cronin Peak and the 14er Mount Antero. Jeep roads that remain from the old mining days allow you to get up high quickly, and since this region doesn’t typically get a lot of snowfall, the trails and summits can be relatively snow-free earlier than other parts of the state. 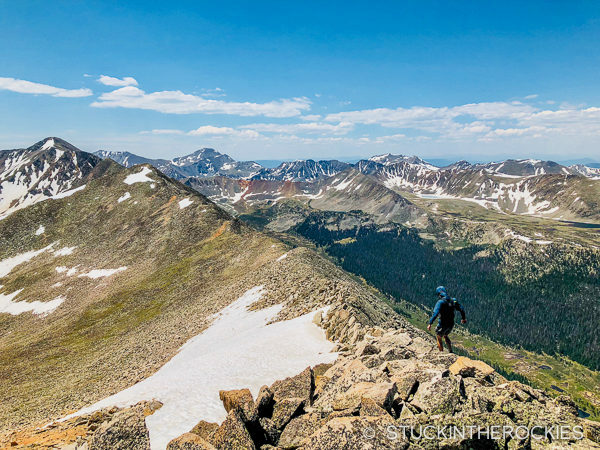 If you’re looking to get up on a summit or two as part of your day, there are no fewer than ten ranked 13ers and 14ers in this cluster of mountains. We covered the loop section in the counter-clockwise direction. Click to enlarge. 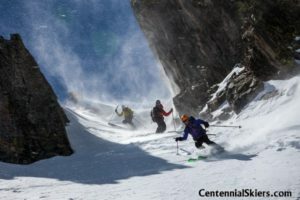 We’ve climbed and skied several of the peaks in this group through the years, and we were aiming to get on top of about four new ones. 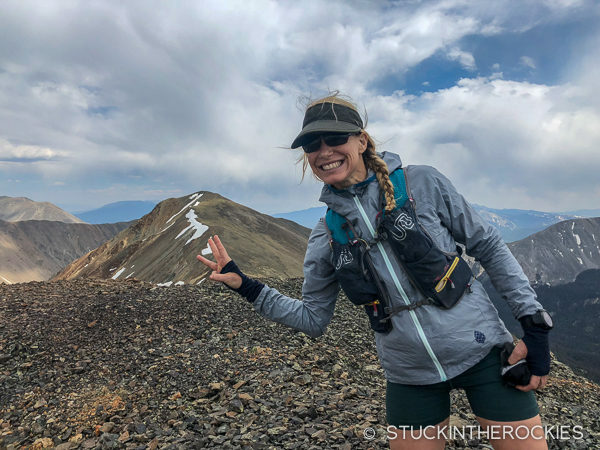 We made a plan to start at the bottom of the Baldwin Gulch Jeep Road and take it as high as we could in the direction of Baldwin Lake and Mount Mamma. From the summit of Mount Mamma, a long ridge heads south/southeast over Grizzly Mountain, Cyclone Peak, and Carbonate Peak. Nearing the top of the Baldwin Gulch Jeep Road. Mount Antero is in the distance. 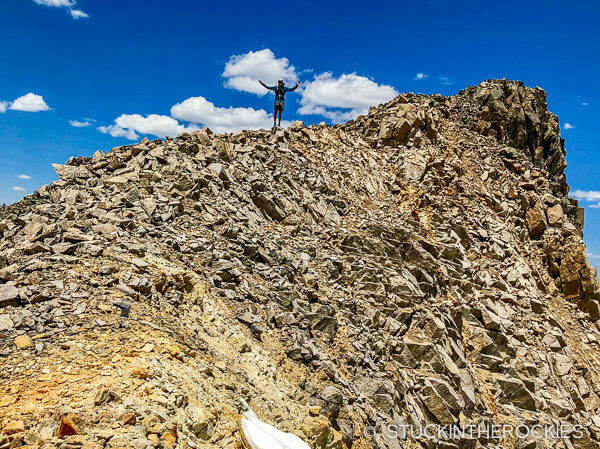 After tagging the summit of Mount Mamma, 13,646 ft., we started along the ridge to Grizzly Mountain. We figured that from Carbonate Peak, the final summit, we could descend east into Upper Browns Creek. 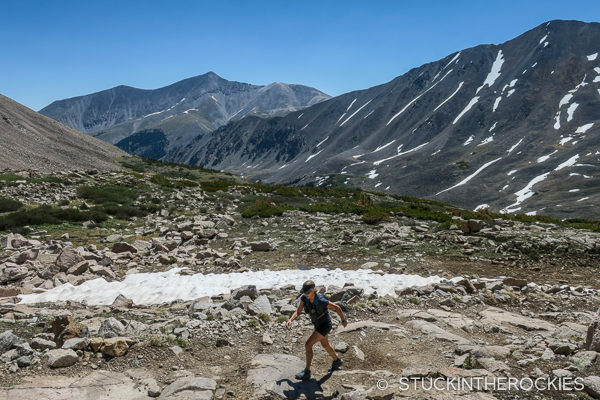 That would allow us to hook up with the old mining road by Mount White and Mount Antero, and give us an easy jeep road descent back down to where we started. 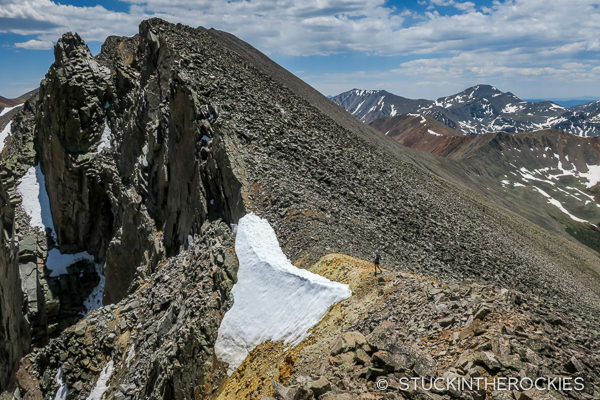 Looking at it from above, it basically makes a large lollipop loop around Cronin Peak, a Centennial 13er. So we just named it the “Cronin Peak Loop” for the day. Christy nearing Grizzly Mountain, 13,708 ft. The footing along the ridge wasn’t always that solid, so travel was slower, more like a hiking pace than trailrunning. Getting up and down the roads are easy, they’re rough for driving but fine for a trail runner. Once on the ridges the terrain is pretty rocky and travel isn’t as fast. 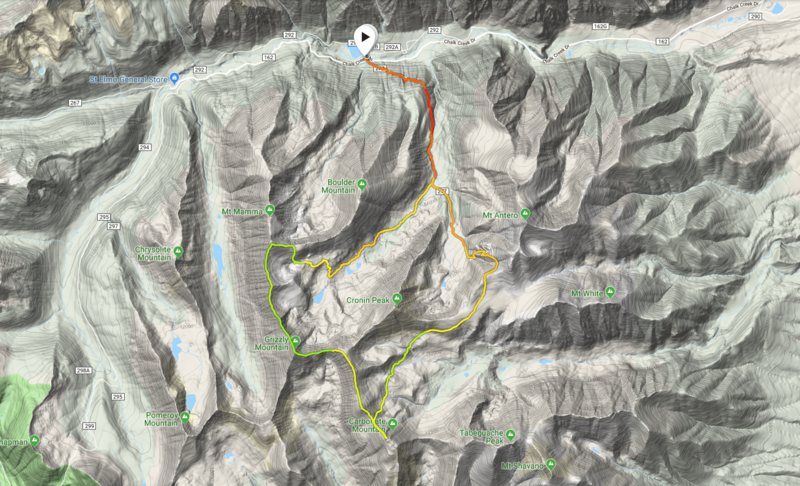 As far as the rough stats for our loop went: it was just about 20 miles in length and climbed between 7000-8000 vertical feet (depending on which device we consulted). We were out for about 10 hours. Just off Grizzly, Christy points the way to Carbonate. Tabeguache Peak is the big mountain out in the distance in the center of the photo. Next up is Cyclone Mountain, 13,956 ft. Carbonate Peak is behind it. On Cyclone Mountain, the 3rd bicentennial summit of the day. From our point of view, the only negative aspect of a day in this region is the likelihood of encountering a lot of off-road vehicles down low. Apart from that, it’s a really cool area for peakbagging and spending time up high. 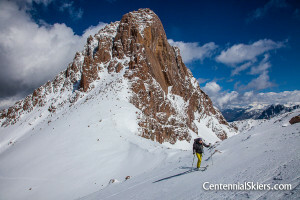 Our route is just one way to set it up, it would be easy to change our route in both length and which summits you reach. If you look at the map and know where the roads lead, you can do all sorts of different peak link-ups. With good weather, or at least a forecast that didn’t call for storms, we had all day to move along the ridge. Tabeguache and Shavano are in the background. On Carbonate’s 13,663 foot summit, looking back towards Mount Mamma, way out in the distance. 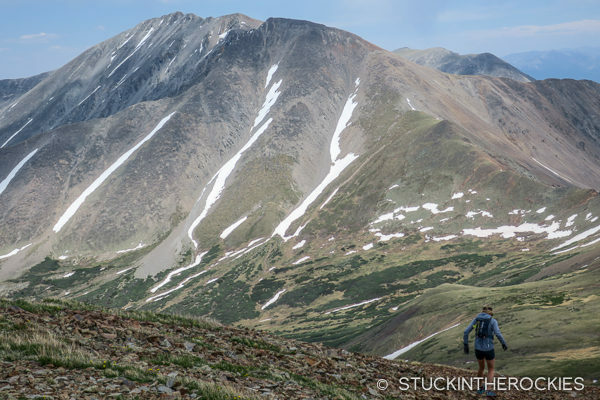 Eventually we made our way down to the jeep road that passes by Mount Antero. From there it was 4-5 miles back to where we began the day. 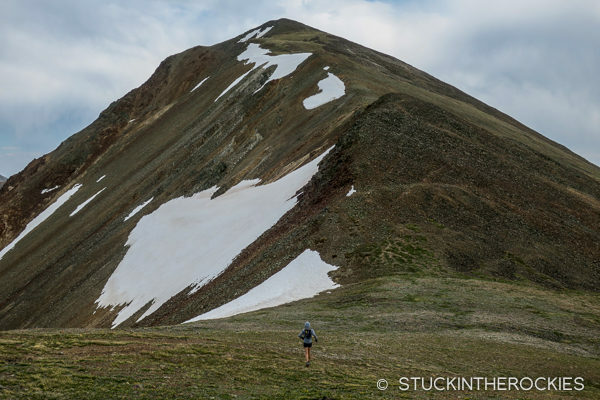 Because of the amount of time you spend up on ridges above 13,000 feet, it’s critical that you pick a day with a low chance of weather. 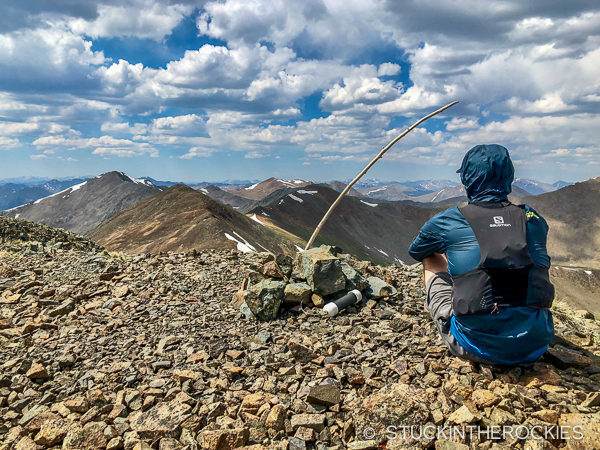 This region of the Sawatch can see pretty nasty afternoon T-storms and if you’re on these ridges, there isn’t anywhere to run and hide if you get caught. So pick a nice day and you’ll have more fun. It was a great day skiing Ice Mountain and North Apostle. 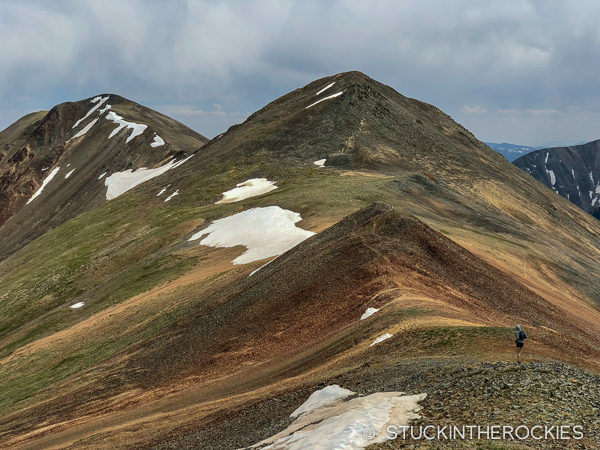 Extra credit for those that add 14er Mt. Antero at the end of the day! 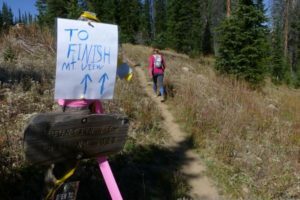 Extra credit options available all day long– Boulder Mountain at the start, Cronin Peak in the middle, Antero and/or White at the end! Fun area, so many options! We were just on Little Brown’s Creek/White/Antero the weekend prior. I’m gonna add this one to my list. 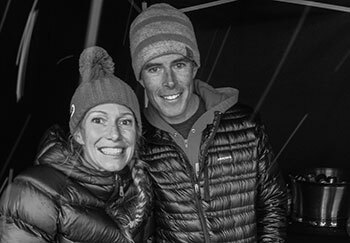 Good stuff, Ted and Christy! 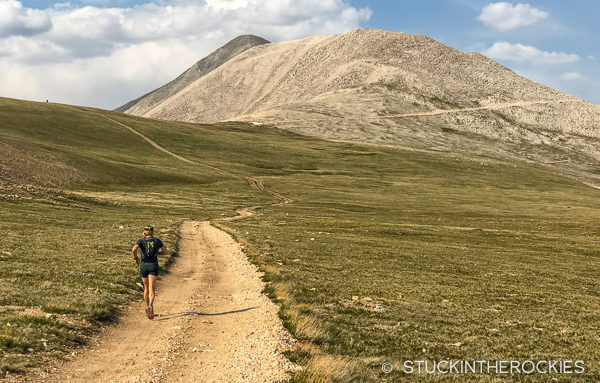 Cool area…We were playing up on White and Antero a couple weekends ago and I’ve got my eye on doing more stuff in and around there based on my good experience on the High Lonesome 100 course, which is great, BTW. Mt. Aetna is one I have my eye on. Hope to see you at SJS50 next weekend! Awesome guys. After being there we figured something like Brown’s to Little Brown’s would be fun. We’ll definitely add it to the list. I’d love to hear about High Lonesome as well. We’ll see you at SJS50 next weekend.